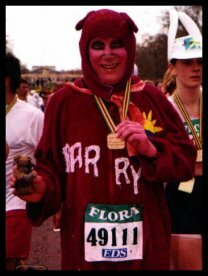 IN 1998 FLORA SPONSORED THE LONDON MARATHON, THIS BEING PART OF THE COMPANY I WORKED FOR I MANAGED TO GET AN ENTRY... SO I AGAIN STARTED RUNNING. THIS TIME THOUGHT I PLANNED TO ENJOY THE EVENT MORE. 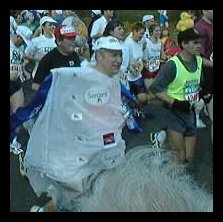 I RAN DRESSED AS A GIANT TEA BAG, GIVING OUT FREE TEA BAGS AS I WENT AROUND THE COURSE, TELLING PEOPLE TO "HAVE A DRINK ON ME". 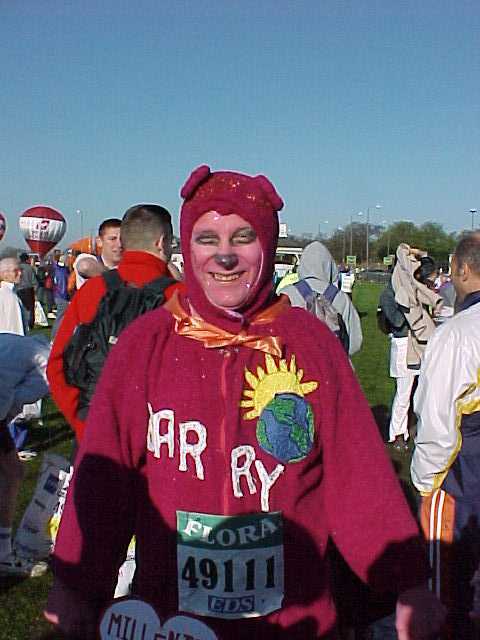 IT WAS GREAT FUN, AND I MANAGED AS IN 1990 TO RAISE A LARGE SUM OF MONEY FOR CHARITIES. DURING THE BUILD UP TO THIS MARATHON I WAS IN MANY LOCAL PAPERS, ON THE FRONT PAGE OF SOME, AS WELL AS BEING INTERVIEWED BY RADIO WHILE RUNNING THE EVENT. 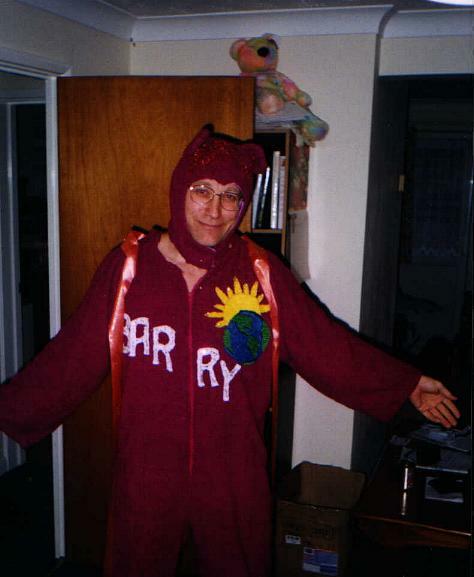 IN 1999 AGAIN I WANTED TO HAVE FUN, SO THIS TIME I MANAGED GO AS A MR PEPERANI (SORT OF A SLIM JIM FOR THE USA FOLK). AGAIN I RAISED SEVERAL THOUSANDS OF POUNDS, AND THIS TIME GAVE OUT FREE PEPERAMI STICKS AS I RAN. 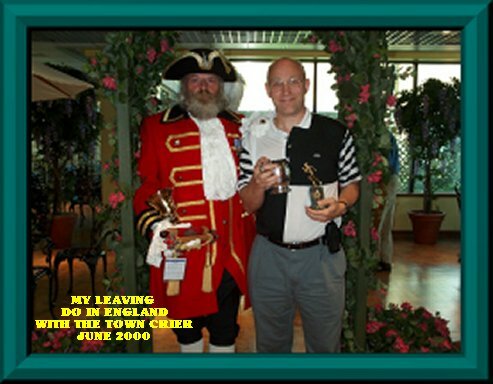 AS IN OTHER YEARS I WAS RUNNING FOR MAINLY CHILDRENS CHARATIES, ONE OF WHICH WAS CHHUGS (Children's Hospice Hugs): WHO PROVIDE TOYS FOR CHILDREN IN HOSPICES ALSO RAISING A LOT OF MONEY BY HAVING FAMOUS PEOPLE AUTOGRAPH BEANY BABIES AND AUCTIONING THEM OFF. WITH THIS IN MIND, PLUS OF COURSE IT BEING A SPECIAL YEAR THE COSTUME DESIDED ON. 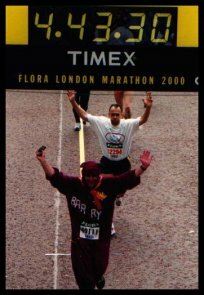 IN DOING SO, OVER THOSE LAST THREE LONDON MARATHONS ALL COMPLETED IN MY VERY LATE FORTIES I HAVE RAISED OVER 5,OOO POUNDS ($7000) OF WHICH I AM VERY PROUD OF. IT DOES NOT MATTER IF YOU GET AROUND IN UNDER THREE HOURS OR UNDER EIGHT HOURS, IT DOES NOT MATTER IF YOUR THE FASTEST OR THE SLOWEST. ENJOY THE EVENT, DO YOUR BEST, AND IF YOU CAN HELP OTHERS AT THE SAME TIME IT MAKES IT ALL WORTH WHILE.